Around 5 a.m., The nurses wake up and begin to prepare for the day. We write our letters and in our diaries if we so desire and then freshen ourselves for the day. Around 6-7 a.m., We head to receive our breakfast, as well as prepare the breakfasts for the patients. Around 7 a.m., We take the time following our breakfast to meet with the other nurses who worked the night shift and receive any updates necessary for the day. Between 7-8 a.m., The Nurses pass out the trays of food to the patients and help to feed those who cannot eat by themselves. 8-9 a.m., Following breakfast for the patients, us nurses go through and assess who needs new bed linens and who needs new clothes. We tidy up the patients and clean them as best we can. 9 a.m., Following this, we take some men outside and begin changing the dressings that need to be changed. 11 a.m., The first of the dressing changes is completed. 12 p.m., The patients are fed lunch. 1 p.m., The second of the three daily dressing changes is started. 2. p.m-5 p.m., We are able to read to those soldiers who wish to be read to. We write letters for those who cannot write, acting as a scribe. Some of us even play cards or other board games with the soldiers to pass the time and distract them from their pain. 5 p.m., The soldiers are fed dinner. 6 p.m., We begin to change the dressings again for the final time. 7 p.m., The day nurses begin to fill out the paperwork for the patients for the day. 8 p.m., The final dressings are finished for the day. 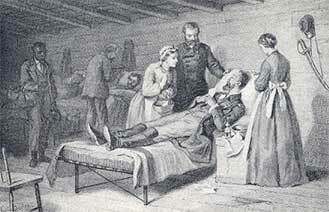 9 p.m., The nurses are able to go to bed and are done for the day, or until more wounded come in from a battle. When patients would die, the nurses would hold them and sing to them. They would take messages for their families, some of which would come and check on them. On a busy day, this schedule would be ignored and the newest casualties and wounded would be tended to first. There would be less time for reading, writing, and playing games with patients due to the increased intensity and volume of the patients. Oftentimes, nurses could hear the cannons and the gunfire, which would allow them enough time to prepare for the new mess of wounded to arrive. 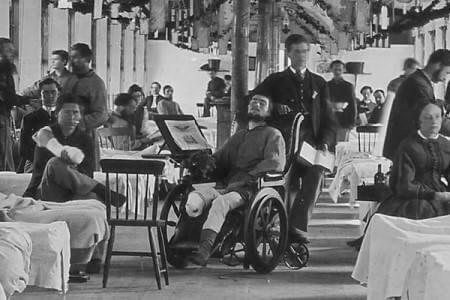 There would be so many wounded in the hospital that the men would be piled on the floor and the nurses would have no where to put them all. They would do their best to clean all of them up and to treat the worst wounds first, then tend to the less serious wounds.